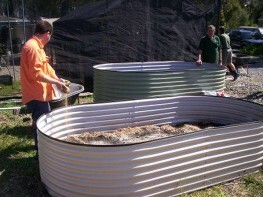 B4C has established a community garden at the Sustainability Centre in Carindale. 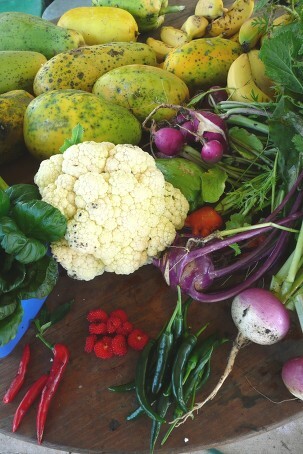 This has been an exciting project, with no-dig beds, orchards and vegie patches. These gardens are open to anyone in the community who would like to come and dig their hands in the soil. Current gardening and nursery days are Tuesday, Wednesday and Friday mornings as well as the first Saturday morning of each month at our Open Days. Please contact our office for more information. 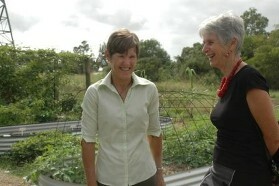 Landcare Australia and Holden supported us in our community garden venture. Our first batch of rosellas was made into Rosella Jam in 2009, much to the delight of volunteers and visitors, while our chickens started producing prolifically. 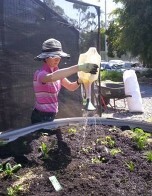 We established the demonstration no-dig garden beds (pictured below), provided by Birdies in 2009.